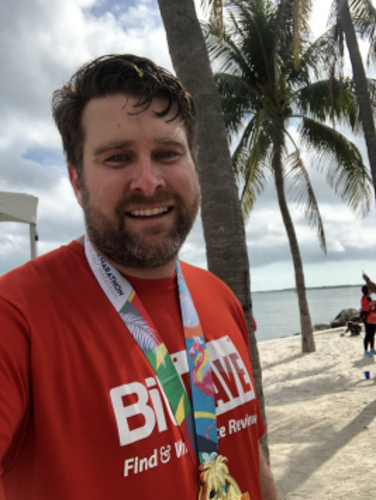 "Did it like a local"
On March 3, I ran the 305 Half Marathon – my second straight year running this race. Set on Miami Beach, it’s a home race for me and signals the end of a long training season that includes one marathon, two 13.1s, and several other short distance races. For me, it’s a victory lap. And, there is no better race to do it in because they know how to have fun. Under the motto – Do It Like A Local – the race team brings out all the stops. Miami already is a special place with a culture that is one of a kind. That is exactly what this race is. Do It Like A Local begins with packet pickup that is held over three days at three local run stores. I chose to pick up from Go Run as it is the store that I go to for all my running needs. Having the packet pickup at these stores lets runners get to know the people who are runners just like them. I’m sure it converts many customers as well. On race day, before you get to the start line you have to stop by the Cafecito tent. Sure, you’ve had coffee before a race, but the added jolt Cuban coffee gives you is indescribable. With the sand and waves to your right, you get in the start corral before taking off on a beautiful course that winds through Miami Beach, over the Julia Tuttle Causeway into downtown Miami before jumping on the MacArthur Causeway back into Miami Beach. You pass cruise ships, breathtaking water views, and run over the four of the five big bridges in Miami. For the second straight year, there was a 305 Drive ignited by Athlinks – a 400 meter race within the race that challenged runners to press their limits. The route is lines with DJs playing reggaeton, salsa, techno, and other types of music you’d hear at local Miami clubs. After crossing the finish line the fun keeps going. In true Do It Like A Local fashion, there is a Pots and Pans PR station. Google “Pots and Pans Celebration Miami” and you’ll learn what this is all about. And the athlete zone is filled with great vendors and even better music as everyone is dancing, celebrating, and having a great time. It is races like these that truly bring perspective into running and execute on the number one rule I have always been taught when it comes to sports. Above all else, you have to have fun. "A New Level for Miami Marathon"
The new additions for this year’s Miami Marathon didn’t begin on the course, it began even before the expo. A new feature added this year was a VIP experience. Runners who registered for the VIP Experience at $150, got more than their money’s worth. From a pre-race cocktail reception on Friday to express packet pick-up at the expo and a VIP area inside the expo that included pre-race massages, warm up apparatuses, and Normatec devices. VIP’s also received a special Lifetime Jacket that is the nicest piece of race swag I’ve ever received. The expo itself was filled to the gills with great vendors. Held again at Mana Wynwood, the Miami Marathon has found a great expo home here. They had lines of food trucks outside in the AthlEAT area, which was awesome. While at the expo, I made sure to visit the exceptional team from Athlinks. It was great to catch up with them, and know they were rooting for all the runners. Their technology got even more sophisticated this year, and spectators loved the ease of use for tracking their favorite runners. The new course layout was a welcomed on for the full marathon runners. Instead of finishing in a wide open area with the sun coming down on us, we had a canopy that kept us cooler. The Miami course is always the star from the cruise ships on MacArthur to Ocean Drive and Venetian Causeway to Downtown and the Grove. You can't go wrong with this picturesque town of the greatest city in the world. I want to congratulate Frank Ruiz and the entire Miami Marathon team. Every year, they add new wrinkles that have taken this race weekend to a whole new level putting it in the upper echelon of marathons around the globe. I finally had an open schedule to run the King of the Hill Challenge at Vista View Park in Davie this year. A friend had asked me to run it several years in a row. It is rare to have a race of inclines in predominately flat South Florida, however this is one of the only races with hills. Set on a former landfill that was made a park in 2003, this race is great. The weather did not cooperate as there was a downpour and it was muggy, but the race was fun. A total of 700 feet of elevation gained (according to my Garmin) during the entire race. At mile 1.75 there is the biggest climb of the race and a race within the race. The runner to complete the .25 mile climb the fastest gets $50. The race ends with a final big climb before a .10 mile sprint to the finish line where you are greeted with a great medal and free ice cream. I picked up my packet at the race so I can't review the expo. The race shirt is a cotton t-shirt with the logo, but the medal makes up for that. "Crushing PRs Miami Style - DALE BRO"
From start to finish this was a great race. Kudos to race crew and volunteers. EXPO: What I like about smaller races is there isn't always a huge expo. Yes huge expos are great, but I love what smaller races like the 305 Half Marathon do. Packet pick-up was over three days and in three different locations - local run stores. This brings more people to these stores and shows why they are better than big department store. I was able to pick up my packet at Go Run Kendall - 2 miles from my house. I love this store, the people there and I hope everyone else does now too. The shirt was very Miami - a pastel purple. It's unique and thats what Miami is. I love the concept for the medal - splitting it over three years to bring runners back. Also love the ribbon, which mimics the turnover chain made famous this year by Da U.
I stopped at two aid stations as the weather was perfect.There were more than enough on the course The volunteers were great and had everything ready for runners. Coming off the 2017 Miami Marathon, race director Frankie Ruiz, told many of us to get ready for 2018 because there were many new things coming. Frankie and his team delivered everything and so much more. The pre-race communication was excellent. Emails got runners hyped, and our local news affiliates began running stories weeks before the race. Fitbit signed on as the main sponsor which excited all of us and the addition of Athlinks as a partner was perfect. The expo - held at Mana Wynwood - was awesome. Everything in one place, packet pick-up was seamless, and it set the tone for the weekend. This was the first chance for Frankie to deliver on his promise and he nailed it. Live fitness classes from local trainers drew crowds. Plenty of running swag. The vibe was set. The race itself was awesome. The course changed a little from years' past but it was a welcome change. The first half of the course around Miami Beach had great crowd support, amazing volunteers working hard to keep us hydrated, and was fun. The second half was a test of will power. It was a humid and windy day. Many runners struggled the second half but in true Miami fashion we helped each other out. This is one of the cool things about Miami. An international race we all may not speak the same language, but we all speak running. A hand on the shoulder, a pat on the back, runners were picking each other up and motivating each other to the finish line. The local crowd knew the weather was tough. There were kids running to and from their garages to hand us cold bottles of water. Dos o tres Abuelitas with hoses spraying us down to refresh us. Once at Mile 25 groups of runners started cheering each other as we pushed to the finish line. As we got to the finishing chute, the plethora of international flags and cacophony pushed us to the end. This finisher's medal is always a favorite because it spins, but the star this year was the medal's ribbon that defines Miami perfectly. Frankie Ruiz and his team put on an awesome experience this year. And with the new partnerships formed, its going to continue to get better.